A wedding is one of the most special events in any person’s life. This auspicious occasion is believed to be made in heaven and is celebrated on earth. The bride and the groom and their families together celebrate the togetherness as the couple takes the vows of “forever”. The wedding function commences by selecting the most beautiful cards as it will be sent to friends and family for inviting them. The wedding invites wherein the name of the “to-be couple” will be written together for the very first time should be nothing less than special. For that, an elegant design should be selected. For most of the times, you see the religious verses or mantras on wedding cards. Hindu wedding Cards have the picture of Lord Ganesha too. It is done to invoke the Gods to bless the couple during the ceremony and for a happily ever after. Your wedding card is the first glimpse of your wedding theme and mood. Set the bar high for your big event. Wedding cards are the beautiful scheduled symphonies send to the guest to inform them about your big event. It gives the detailed information about the venue along with date and time of all the wedding ceremonial functions. As we are talking about the biggest celebration of your life, your “wedding”, likewise your wedding invitation shouldn’t be any less than royal, elegant and unique. It creates the very first impression of the style of the wedding ceremony. Choose accordingly. 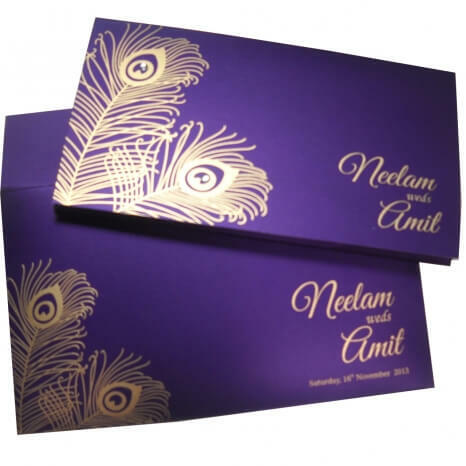 There are many factors that are to be considered while choosing an Indian wedding card. Some of them are budget, the size of the paper used for wedding invitations, designs, colors, any other inclusions and many more. The best thing is you have got a whole deck of variety to choose from along with the greatest option of customization. You can customize your wedding card the way you want after all adding personal flair won’t cause any harm. Another important factor to be considered is the reflection of your culture on your wedding card. The wedding is defined as tying the knot of togetherness in the presence of God. For example, a Hindu wedding card can include religious verses or a Muslim wedding card can include the symbol of Bismillah. Also, the design and the texture of the wedding should be aligning with the styled theme of the wedding. The wedding cards are generally sent five to six weeks prior the big day. 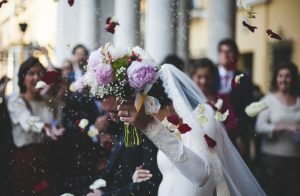 Some guests get to know about the big event only after the invitation while for some of them it is one reminder so as to book the dates for the wedding. This simply means you have to be very specific about the designs and style of your wedding card from the very beginning. Weddings are the first of the many ceremonies you are going to celebrate with families and friends together as a couple (well officially). So why not choose the best of Indian wedding cards to invite them for the biggest “panache of togetherness and love”.